Advertising is an ancient art. In the Babylonian sea ports, merchants hired barkers to announce the arrival of wine, spices, and fabrics. Citizens in Greece hung “Lost” posters in hopes of being reunited with children, jewelry, or slaves. And elaborately painted signs (billboards) sprung up throughout Pompeii to announce plays, carnivals, and races. You shouldn’t be. The history of advertising is full of the tools, tactics, and strategies you — as online marketer — still use. Let me show you why this matters. The first printed advertisement in English was a 3-by-5 inch handbill that offered a prayer book for sale. Shortly after that came the most sustained advertising campaign in the history of the modern world: colonizing America. The word “free” ring a bell? It holds the same persuasive power more than 300 years later. And it was the copywriter who would come to dominate the field. In other words, the writer runs this show. You should study advertising history for the same reasons you would study military history, political history, or economic history. All from studying the past … which, in addition, serves as a corrective to our chronological snobbery. See, we are often seduced by data, social media, and the intrigues of Google … mistaking tools for tactics and science for strategy. But the history of advertising will help us get our heads on straight. So, as part of your induction to this history, I want to introduce you to 13 dead copywriters and their best ideas. You will recognize a few names. Some you will not. I tried to focus on the lesser-known ideas (avoiding the obvious and the abused) … and, more important, how they can apply to you today. You’ll run into some surprises, too. Like Bill Jayme’s heretical approach to copy. Or Mel Martin’s trick to surfacing our deepest concerns. Or the videos … lots of videos to bring the ideas alive. So here are The 13. Enjoy! Depending on what circles you run in — self-help or direct-mail copywriting — you’ll likely remember the name Robert Collier (1885 – 1950). He was born in St. Louis, Missouri, and as an adult he got a gig with his uncle at his publication Collier’s Weekly. He learned how to write, edit, and research there. But he’s probably best known for his 1926 book The Secret of the Ages. This book sold more than 300,000 copies during his lifetime. His focus was on abundance, desire, faith, visualization, and becoming your best. He’s a legend in that field. Collier sold millions of dollars worth of books — like H.G. Well’s 4-volume “Outline of History” — on the back of his copywriting. In The Robert Collier Letter Book, he shares the direct-mail letters he wrote and explains why they were successful. What was his secret to so many successful sales letters? What emotion do you want to produce in your reader: Envy? Flattery? Pride? Any one of these 50? Once you’ve decided upon the emotion, then write in such a way that brings that feeling to the surface. Victor Schwab (1898 – 1980) started out as a secretary for Maxwell Sackheim when Sackheim was at Rathrauff & Ryan’s. He did such a good job improving Sackheim’s copy that he was promoted to copywriter. Schwab believed in deep research. He tracked results with coded coupon ads. He tested headlines, copy appeals, copy length, layouts, calls to action, and split runs. He was a content marketer before his time, creating comics for clients like Sherwin Cody (English Classic Courses), Dale Carnegie, and bodybuilder Charles Atlas. I pointed this out in copywriting exercise number 3. And this is not unlike the idea that videos on landing pages will boost conversion. My favorite example, however, of showing a product in use has to be Blendtec blenders. The Great Depression was hard on ad agencies. Except for those agencies that “got” advertising. Ruthrauff & Ryan was such an agency. Before the Depression, it was looked down on as a hard-sell mail-order shop with layouts that mimicked tabloids and boldly warned the world of sensitive issues (body odor, for example) in soap ads. And it was inside that humble little shop that the most successful headline ever was written. John Caples (1900 – 1990) learned and perfected results-oriented mail-order copy at Ruthrauff & Ryan. It was there that the account from the U.S. School of Music was put on his desk … a company selling a correspondence course on piano playing. And for nearly fifty years John Caples dominated advertising. He has an industry award named after him, and he wrote my favorite book on copywriting: Tested Advertising Methods. One of the early lessons I learned from that book was how to open a sales letter. He says to study the Reader’s Digest. What do you see when you do that? In Caples’ famous headline, you see these elements playing out. A favorable, specific image is projected, which teases. That is why you keep reading. Mr. Schwartz (1927 – 1995) was not only a successful direct-mail copywriter — launching careers and corporations with headlines like “Give Me 15 Minutes and I’ll Give You a Super-Power Memory” — but he also channeled his experience and wisdom in books, including the legendary Breakthrough Advertising. That book is a graduate-level education on direct-response copywriting. And to give you an idea of how valuable it is, the cheapest you can find it on Amazon is $95. It’s complex, scientific stuff. Headier than Claude Hopkins. Despite the complexity, Schwartz was pushing one simple idea: write copy that satisfies one dominant desire (not unlike Collier above). Tap a single overwhelming desire existing in the hearts of thousands of people who are actively seeking to satisfy it at this very moment. Get it wrong, and even the greatest copy won’t matter. Maxwell Sackheim (1890 – 1992) was born in Kovna, Russia. In 1915 he founded a New York advertising firm with business partner Harry Scherman. Eleven years later, he and two other associates — Mr. Scherman and Robert K. Hass — founded the Book-of-the-Month Club, which according to the New York Times was the nations’s first direct-mail book club. Sackheim eventually sold his share in the club and worked with the Brown Fence and Wire Company during the war (eventually becoming president) before returning to advertising to start his own agency. This was Sherwin Cody’s 100% Self-Correcting Course, a patented mail-order course in English that was taken by over 150,000 people. The ad ran for 40 years. Most businesses don’t last forty years. The success of this headline has been deconstructed thoroughly (it’s part of our Magnetic Headlines). The way this played out in advertising was that his advertising letters would come from the mouth of the client. His “The Gloucester Fisherman” for client Frank E. Davis is his best example. The ad shows Mr. Davis’ awkwardness in writing a letter to sell his fish. Mr. Davis confesses he’s neither a writer nor an advertiser — he’s a plain fisherman: comfortable close-hauling a sail and picking out the best fish of a catch, but not writing a letter to sell fish. (He even questions whether what he knows about fishing can benefit him in a business way). You can sense an honest man showing his vulnerability. Showing his weaknesses, his ugly side. This guy doesn’t want to make a fast buck. He just wants to make a living. And he hopes you will help him by buying some of his fish. Omaha Steaks and Texas Ruby Red Grapefruit are current manifestations of this tactic, and across the web this technique is ubiquitous. These days you’ll still see CEOs showing up in their advertising. Sometimes they even star in the commercials. Rosser Reeves (1910 – 1984) started as a reporter in Virginia before moving to New York City. He was another advertiser who rose through the ranks during the Great Depression. He finally joined the Bates agency in 1940. Like David Ogilvy, Rosser Reeves was a man with many interests. He was well-read, well-traveled, and had an appetite for the best food and drink. He promoted a hard-sell approach, and, like Ogilvy, thought advertising should do one thing: Sell. Campaigns for Viceroy cigarettes, Carter’s Little Liver Pills, Listerine mouthwash, and Colgate toothpaste boosted sales and put these brands on the map. His most famous ad, however, was for Anacin, which, amazingly, promised to relieve pain, depression, and tension … fast. He goal was to get customers to recognize a specific brand proposition. Reeves was picking up where John E. Kennedy and Claude Hopkins left off: the no-nonsense “advertising must sell” approach. Since then the USP has been revised and tweaked. These days your USP doesn’t have to beat everyone else out. It just has to play nicely with the other offerings in your group. That means you can create a USP based upon the “crossroads,” a metaphor, or by making it persona-driven. And keep in mind, restating your USP is not to be confused with simply repeating words. In 1998 Time magazine named Leo Burnett (1891 – 1971) one of the 20 most influential business leaders of the 20th Century. He’s the only advertising executive named. And his name is behind one of the world’s largest ad agencies, one he built during the Depression. Burnett believed in finding the drama — or the story — behind your product. How do you get there? Steep yourself in your subject, work like hell, and love, honor, and obey your hunches. Of course you need the essential elements of a great story. Burnett told great stories through his “critters” … mythical creatures that represented American values. Think Jolly Green Giant, Tony the Tiger, Pillsbury Doughboy, and the Marlboro Man. If you want to see a great example of this in action today, then watch this marketing story by Volkswagen: “Once More. The Story of VIN 903847”. Fairfax M. Cone (1903 – 1977) started his career in San Francisco at Lord & Thomas in 1929. By 1939 he was managing that office, and two years later he was relocated to New York City as a vice president. He took over the Lucky Strike cigarettes account — the largest account at Lord & Thomas. Eventually, when Albert Lasker retired, Cone and two other fellow vice presidents launched their own agency: Foote, Cone & Belding. Cone strove for clarity and honesty in advertising. In other words, he avoided the clever and cute. Good advertising is written from one person to another. When it is aimed at millions it rarely moves anyone. The goal is to discover who your ideal reader is. Is she an executive at a non-profit? A professor at a private school? A car mechanic in Atlanta? Once you discover that ideal reader, write to her. And her alone. Arriving on his first day of work at Lord & Thomas agency, Albert Lasker (1880 – 1952) looked at the company logo hanging in the lobby and scratched his head. It read: “Advertise judiciously.” Lasker didn’t know what to make of it. That confusion triggered a one-man campaign for clarity, beginning with Lasker’s first assignment. It was an ad, with the headline “Deafness,” and followed with a list of product features. Lasker rewrote the headline to “Deafness Cured” and then went on to explain the reasons why prospects should buy this product (all emotional reasons). Why should I buy right now? Recently I’ve been introduced to the “greatest copywriter nobody knows.” He helped turn the publication Boardroom into a multi-million-dollar operation. Marty Edelston, the founder and publisher of Boardroom, feared that if his writer’s name got out he’d be snatched by another company. Well, it’s safe to share his name now. It’s Mel Martin (? – 1993). He worked slowly, and even teetered on the edge of bankruptcy because it took him so long to write an ad. But those ads are a master’s-level course in fascination copy. And pretty much everything we know about seducing readers with the tease, we learned from Mel. From our position in history, these teases are familiar, almost routine … but no less effective. So, go after those points of maximum anxiety. Figure out what is keeping your reader awake at 3:00 in the morning. And then paint a scenario that makes your reader’s skin crawl. The late Bill Jayme (1926 – 2001) was one of the greatest direct-mail copywriters in the modern magazine industry. He was, as he happily said, the “junk mail” star. At Time magazine, working in the circulation department, he wrote the unorthodox “Cool Friday” letter … a letter that opened with “Dear Reader,” and rambled on about the state of the nation before he got to the point. That letter launched his career. From Time he worked at CBS and McCann-Erikson before ditching the corporate life to work for himself. Back in the 60s, 70s, and 80s, publishers flew to California to beg him to write a subscription letter for their magazine. Clients included the Smithsonian (who alone mailed 280 million Jayme letters), Esquire, and Businessweek … offering him up to $40,000 per letter. Jayme had a way of making friends with the reader. Of respecting that reader’s intelligence. Of always being fascinating. And selling ever so gently. His approach, however, was far from scientific. It was from the gut, based on intuition. Jayme channeled his creativity and persuasion into his notion of transubstantiation: the idea that a product or service must be transformed into something magical. You know it. I know it. Everyone knows it. If you’re planning to succeed in business over the coming decade, you’ve now got just two choices left. You can come to terms with the computer. Or you can marry the boss’s daughter. In other words, he’s not selling features or facts (which you need). He’’s selling a new life. And mastering the basics of computing are the gateway to that life. Gary Halbert (1939 – 2007) died less than seven years ago, in 2007. And direct response marketers knew they lost a legend when he died. A 381-word marvel of human psychology. That letter not only put Halbert on the direct marketing map … it led him up to the throne. Many have called him the Prince of Print. The King of Copy. On the back of that letter, Gary created a business that eventually sold to Ancestery.com. After that there came a dozen more such legendary ads. In later years he shared his marketing lessons in the Gary Halbert Letter, a print newsletter which is now online. You are now about to learn the most important thing you will ever learn on the subject of direct mail. I have a similar lesson to teach you about newspaper and magazine advertising, but that will come later in another letter. Right now, we will talk only about direct mail. Whatever. Professor Halbert is now going to give you his semi-famous “A-Pile/B-Pile Lecture.” It goes like this: Everybody in the world divides his mail into two piles which I call the A-Pile and the B-Pile. The A-Pile contains letters that are, (or appear to be), personal. The B-Pile contains everything else: Bills, catalogs, brochures, printed announcements, envelopes that obviously contain a sales message, and so on. In the age of the Internet, that analogy has transformed into maxims like this: your competitors are just a click away … and you have just four seconds to grab their attention. Halbert would tell us the same thing he told the junk mail crowd: do whatever you can to get noticed. Get attention … and keep it. 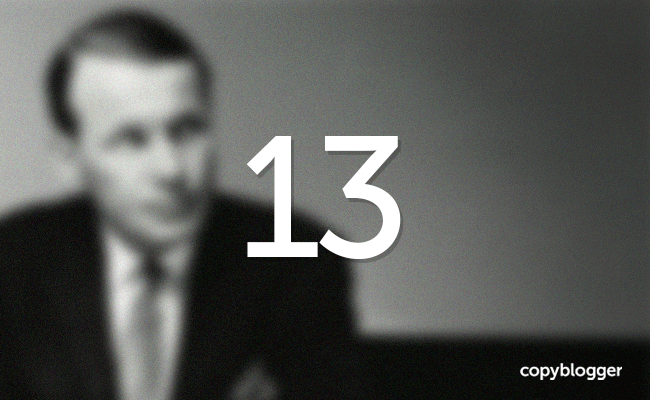 There is no shortage of love for David Ogilvy (1911 – 1999) at Copyblogger. Just take a peek at a few of our articles. There’s good reason for that love. He also wrote two fascinating books Ogilvy on Advertising and Confessions of an Advertising Man. But don’t let that elegance or brevity fool you. What did he mean by creativity? Repeat your winners. Scores of great advertisements have been pulled before they’ve begun to payoff. Readership can actually increase with repetition — up to five repetitions. What Ogilvy meant when he said “creativity” was this: don’t change an ad if it is still generating revenue for change’s sake, for creativity’s sake. If it’s bringing in significant revenue six weeks from now … keep running it. Twelve months? Keep running it. Fifteen years? Keep running it. In addition, he’d tell you to stick with the fixed principles. Don’t get cute and create new ones (unless they are backed, repeatedly, by results). Remember: your job is to sell. And if this kind of selling (known as direct response) is new to you … we’ve got 15 free ebooks that will help you master that learning curve. Excuse me: where are all the women? But I can’t tell you either reason right now. It will have to wait until I’m ready. You might have also noticed there’s not a single woman mentioned in this list. Not because I’m a misogynist, but because I made an incredible discovery recently about women copywriters during the 75 years prior to 1950. And I’ll be sharing that little surprise with you, too, in a future post. First, however, I want to take some time to offer you a series on native advertising. Which I’m thoroughly looking forward to. I hope you are, too. Next article: Why Are You Still Skeptical That Pinterest Can Work For You? Super article… can’t wait to hear what else you’re planning to share. May I add one? The late Howard Luck Gossage was funny, smart, and wonderfully grumpy. He wrote: “The real truth is… no one reads an ad. People read what interests them, and sometimes it’s an ad.” It’s expensive on Amazon, but I highly recommend picking up a collection of his thoughts and essays called The Book of Gossage. And the other real truth is… no one likes typos in comments. If you’d be willing to change my “and ad” to “an ad,” I would be most grateful. Howard Gossage’s ads are awesome. Nothing wrong with being human. On the subject of Gossage, I highly recommend this book — Changing the World is the Only Work For a Grown Man, by Steve Harrison (AdWorld Press). Part biography, part eulogy, it’s a more than fitting tribute to this most charismatic of ground-breaking admen. After awhile “very” and its substitute lose their effectiveness because they are essentially meaningless words, serving no real purpose other than to obscure all your wonderful thoughts. Anyway, if you need two adjectives you’ve probably got the wrong noun. Just saying. I’ll definitely hang in. And sorry for the poke, must have been the coffee. I honestly didn’t realize it was a damn series. So it was the right word after all! I’ll be watching for the next one. Thanks for your damn comment, Rick. Since I am “all about history” and the roots and origins of success, I loved, loved, loved this post. I have been a avid reader of Copyblogger since 2009. It just keeps getting better and more relevant! Thanks for sticking with us … it’s our obsession to get better and remain relevant. Damn! You had me by the eye balls at the headline. Great info. Well composed. I’m still here thinking, and will re-read this often. What was old is new again. Thanks a million. I love this post – with all the advanced technology it’s a comfort to know that as a writer my profession is old and new at the same time. Indeed. It’s not going anywhere. Did you purposefully break the common modern web writing rule to NEVER use $100 (big) words? This is swipe file bound. Occasionally you bend those rules to make sure people are paying attention. Interestingly enough, it was Jayme who broke this rule, not wanting to insult people’s intelligence. Thanks for the kind words. The greatest about this post is it demonstrates great storytelling combined with how-to and a clear demonstration that the author knows his stuff (pulling out all the important points of so many books). For me that is the most authoritative kind of text I can read. Wonderful article – a veritable 101! I also appreciated your illustrating your theme through language – history, heresy, transubstantiation… Real value-added if you understand the references, and yet the message is clear even if you don’t. And answering objections before they’re made – very well done! An example of best practices in and of itself. Saving and sharing this one repeatedly. Looking forward to the rest. The smart learn from their own experience, the happy also learn from the experience of others. Thanks for a great post, oops, series. Yes, the wisdom of mentors is priceless. What an amazing list! Granted some things in the marketplace have changed, but the most important thing hasn’t changed at the core: Human Beings! The emotional drivers that trigger someone to reach into their pocket have been the same for a long time, and they will continue to be for even longer into the future. Thank you for the reminder! This article is so good, it’s worth reading three times; twice today and again next month. Wish more advertisers paid attention. Nicely done! I love the hook at the end. I now HAVE to read the next few posts you write to find out about this discovery relating to women! You’re devious Demian! But it worked. Please don’t keep me waiting too long! Amazing post Demian. Extremely useful. Makes Copybloggers top 5 posts! This is a fantastic sales seminar rather than a simple blog post. Thank you for all of this tremendous information. I’ve heard of some of these men but thank you for the videos and links to research further. I look forward to the future surprises you have in store. Which is why in this “never-changing” world, I’m glad to have bet on words and storycraft. Both have served me well no matter my official job title. Reading your introduction, I thought I could guess one of the entries given our shared Southern(most) Illinois heritage. But nope, I was wrong. You see my first memories of cruising bluff-lands come from riding shotgun in my Grandpa’s powder-blue Impala listening to the few stations the antennae could pull into the AM dial. My grandpa was the son of a preacher, the descendant of a long line of farmers, as well as a charming old-school salesman. He was also obviously of mixed racial ancestry which was illegal at that time in our history. So how did he survive…no, thrive in those conditions? Needless to say, my politics are more than slightly to the left of radio personality & copywriter, Paul Harvey’s, but I appreciate his skills, results, and longevity. The fact that my grandfather could mimic Harvey’s tone and ways made it much easier for folks to turn a color-blind eye. My childhood lesson was that you don’t have to agree with everything about a person in order to appreciate their God-given talents. I LOVE these longer pieces! They feel so luxurious. Great series. Can’t wait for more. Great comment, and thank you for introducing me to your grandfather. Sounds like a man I would’ve loved to meet. Did you read my productivity article on my grandfather? And thanks, it’s good to hear you like these longer posts. I love to hear what people think (good or bad). I appreciate both high and low brow. I think they have much to gain from rubbing elbows with each other. Yep, again. I loved the post about your grandfather. The Upper Mississippi Delta has a terrific storytelling tradition. Few of us have the time to read these longer pieces on a daily basis., but as an occasional treat they are a joy to savor. Always love getting history lessons while reading practical advice. Can you please stop including outbound links so I don’t need to even momentarily consider leaving the article? I left a comment earlier and it’s not here for some reason 🙁 Maybe I got distracted and didn’t publish it. So, I had to say again how much I loved this post! It was like a sales seminar not just a blog…so much tremendous info. I just read the Ogilvy piece and took notes. There is so much here I could be busy for hours reading and watching how to sell. Thank you, Demian!! Demian, thanks for an entertaining, epic post! Wow, excellent post. It awakened some lessons learned in college, where I chose art direction over copywriting, thus breezed through one copy course. I kept glancing over to my bookshelf where “Ogilvy on Advertising” has rested for the last decade. It’s calling me. I think I am high on words, the science of selling and the art of the well crafted verbiage. I think I could live for days, maybe weeks, on the resources linked in this post. Sweet. Yes, that was the intention, Torie. Don’t forget the 15 ebooks, too. And “Ogilvy on Advertising” is a GREAT book. Worth a re-read. This post was like peanut butter & chocolate together for the first time. What, no love for the late, great Billy Mays? No one could move products like this informercial pitchman! Thank you for such an acerbic article. Early to bed. Early to rise. Work like hell and advertise. (prob Ogilvy!) back in ’59! And he was paying homage to a line from the 1735 edition of Ben Franklin’s Poor Richard’s Almanac. Well, it was 1958/9 when the headmaster pulled me out of my Primary school morning assembly for making this ‘flippant’ reply to what was (I guess) his serious moral message to his tender flock! Demian, wow! What an awesome post this is. Well-researched, fact-packed and very informative for all bloggers, writers and copywriters today. Although the world has changed greatly today, still, these ideas have a punch in them. A lot of them still makes a lot of sense and they just can’t be ignored. While I’m still figuring out how to put to practice what I’ve just read, I also can’t help feel astounded by these great copywriters and how they came up with such solid ideas back then. One thing I noticed is that most of these individuals lived long and probably happy lives doing what they love. Something to definitely think about. Great point, Matt. I thought they found a way to be economically viable. I learn a lot from these copywriters. Yes, sometimes, the “dead dudes” are those that stays alive long enough to outlive all others who are living, one aspect i love here is the “article title”! Talk bout having a grabbing headlines, everyone wants to know what it is about! I often feel with direct marketing gaining prominence again, it is imperative that we marketer go back and read the Oglivys and Laskers. wow i love the bit about “anticipation copy” Its a concept that is new to me.. i know. i might have to get out more. But its going to be my research for the next week/month..